The recitation of this simple, meditative prayer is one traditional way of spending Advent in preparation for Christmas. It is often called a Christmas novena, and although a novena is normally a nine-day prayer, the term is sometimes used for any prayer that is repeated over a series of days. Time and usage have come to call this novena “The Saint Andrew Christmas Novena” because it is prayed 15 times every day from the Feast of Saint Andrew the Apostle (November 30) until Christmas, since the First Sunday of Advent is the Sunday closest to the Feast of Saint Andrew. You can say the prayer the 15 times all at once, or divide up the recitation throughout the day as devotion or necessity dictates. The novena is not actually addressed to Saint Andrew but to God Himself, asking Him to grant our request in the honor of the birth of His Son at Christmas. Prayed as a family, the Saint Andrew Christmas Novena is a fine way to help focus the attention of both children and adults on the Advent season. At this time of year, joining the Cross of Christ with the Birth of Christ is not so very strange, since Our Savior came to earth to bear the Cross that became our life and our salvation.It has become a beautiful phrase to describe the life of Our Lord, “From the Crib to the Cross, He sacrificed Himself for us.” The day before the Feast of St. Andrew, November 29th, Crib and Cross are joined in the Carmelite liturgical feast day of two men given the title of first martyrs of the Carmelite Reform. Blessed Denis of the Nativity and Blessed Redemptus of the Cross. Both of these men are remarkable in that they were late vocations, having both had successful careers before becoming Carmelite friars. Blessed Denis of the Nativity was born in France, on December 12, 1600. As a young man, he sailed abroad to Spain, England and America, becoming a skilled navigator and a cartographer. Because of his valor and genius, he became first pilot of the kings of France and Portugal. Some of his cartography, the Maritime Tables, is still preserved in the British Museum. In 1635, he joined the Carmelite community in Goa where he was an example of virtue to all and was graced with the gift of contemplation. Blessed Redemptus of the Cross was born Thomas Rodrigues da Cunha in Portugal in 1598. His early career before becoming a Carmelite was predominantly in the military, serving as a commander in the Portuguese army. In India, at Goa, he, too, joined the Carmelites and became a lay brother. The front side of the medal depicts the Blessed Mother standing on the globe of the world with her feet crushing the serpent’s head, and with rays flowing from Her hands to the globe and all around it. An inscription, “O Mary, conceived without sin, pray for us who have recourse to thee,” is traced around the figure of Our Lady, a reminder to us of the singular grace that God bestowed upon her: her Immaculate Conception. This privilege made her worthy to become the Mother of God and is therefore the source of her motherhood over us as well. On the reverse of the medal, is a large “M” intertwined with a cross. What beautiful Catholic devotion and doctrine is depicted by this one symbol! We see our Blessed Mother at the foot of the cross, one with the cross, and yet also hanging upon it. Co-Redemptrix with Our Lord, she is also subordinate to Him and dependent upon that same redemptive sacrifice. Below this symbol we see the Sacred Heart and Immaculate Heart of Mary, again expressive of the Union between them, two hearts as one. Twelve stars surround these images. They represent the twelve tribes of Israel, the twelve Apostles – symbols themselves of the entire Church. We ourselves are these stars, which serve as a reminder that it is through the Cross that Our Blessed Mother became our Mother – Mother of the whole Church and of each individual soul that belongs to Her Son. So many miracles have been attributed to this medal, that it has come to be known as “the Miraculous Medal.” Catholics use it on their rosaries, as key chains, on bracelets, but it is important to remember Our Blessed Mother’s words, that the medal should be worn “around the neck.” Once again, it is important to have the medal blessed. Unblessed, it is just a piece of metal with a few devotional symbols. When it is blessed, it is placed in the realm of the supernatural, becomes God’s property, and a powerful tool in the hands of the Blessed Mother. Learn more fascinating details about the Miraculous Medal in our Doctrine and Devotion section, as well as in the book, The Miraculous Medal, with gives a thorough history of the medal, the spreading of its devotion and stories of the miracles God has wrought through Our Lady. You will recall that we spoke about prayer chaplets in our last newsletter. The St. Andrew Christmas Novena we mentioned above can be prayed with a chaplet, and we have added this new chaplet to our selection. Advent calendars and wreaths also offer the traditional annual way of observing this season of preparation. Our November newsletter always provides a few suggestions for Christmas gift-giving, so we will again share some ideas with you. 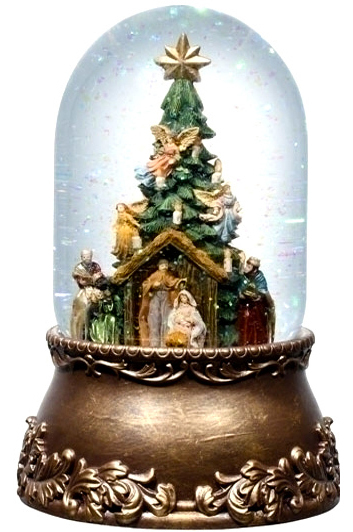 In the early years of our website, we offered old-fashioned music-box “snow-globes.” For a long time, they’ve been out of fashion, but we were delighted to find these are available again – except now they are called “glitter domes.” Whatever the name, they make a lovely gift for Christmas. Mostly, we’ve been pleased that the Christmas carols are still with the sound of an old-fashioned music box, and not the obnoxious sound of computer music! Other new, beautifully designed nativity ornaments, figurines and Christmas art items are also among the tasteful decorations offered for the season. All these, and other new items, can be found on our new items page. Yes, of course! We are happy to present a new Christmas book for “children of all ages” – all of us here love God’s Gift of Love: A Christmas Story. And what is special about this book? It presents the story of Our Lord’s Birth in a dignified, genuine way, with the beautiful illustrations expressing what the text may not say. 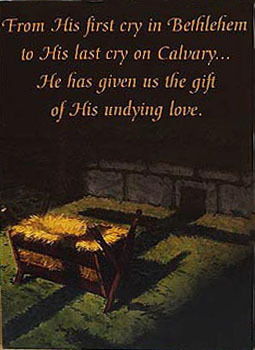 The miracle of God becoming Man in hidden, humble circumstances is memorably portrayed and will be a treasure for years to come every Christmas. Children carry memories all their lives of the early moments of their young lives. As adults, we remember with deep fondness certain images of our past – and especially of Christmas and the storybooks we read year after year with our parents, grandparents or other older relatives. Rather than the modern “cartoony” representations of the Bible for children, the illustrations of this book will offer memorable images of the Savior’s Birth, inviting devotion and strengthening the faith of little ones, drawing them to read Holy Scripture itself. For the season’s celebrations with family and friends, Favorite Christmas Carols will be handy to have on hand. This is a wonderful way to teach the true Christmas carols to children more familiar with Frosty the Snowman and Jingle Bells! … For friends of the Little Flower, Saint Therese:120 Daily Readings will make a perfect gift as a daily devotional. Also new to our book selection are the esteemed Carmelite Saints’ writings and quote notebooks from the Des Plaines Carmel. The wise thoughts and counsels of our saints are presented in clear, handsome calligraphy and are ideal for setting out as a daily inspiration and reminder of God’s presence…. 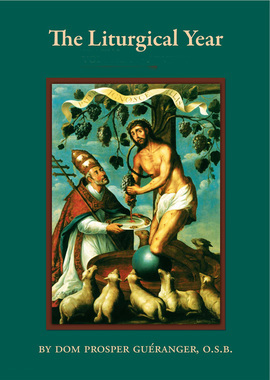 We are now offering the 15-volume set of Abbot Gueranger’s Liturgical Year. This monumental work was the daily reading of the Martin Family in Lisieux and helped to form a saint – and a holy Catholic family! Each liturgical season and feast day is treated and presented as the very fabric of our life as Catholics. The work is the very best guide to understanding, appreciating and keeping those feast days that honor God, His Mother and His Saints. As we have discovered for many years in our own Carmel, reading this work is both enriching and inspiring and is itself a source for daily progress in prayer and the spiritual life… Be sure to keep in mind for gift-giving simple prayer books. These collections of prayers are more important than we realize, helping along our sometimes limping start to conversation with God each day. What better gift than a book that becomes a door and a path to prayer, a companion along the way? 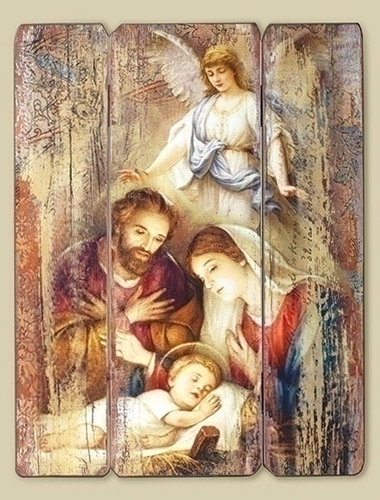 For Christmas meditations, you may benefit from having on hand The Life and Glories of St. Joseph, which presents the mystery of the Incarnation and Nativity from the holy view of this great friend and earthly father of Christ. Of course, the sermons and thoughts of St. Francis de Sales, St. Francis of Assisi, St. Thomas Aquinas and others offer prayerful meditations for the season, too. Don’t forget our beautiful Christmas cards, which we now offer singly as well as in packages of 10. We thought you would appreciate being able to obtain many different designs for more individual choosing for special people and the message you want to send. In our last letter, we told you of all our repair pursuits at the Monastery. Altering the kitchen aprons to make them longer to protect our habits was one of the last projects that really needed to be done. The plaid fabric was sturdy and what we had on hand, so it was put to use! Of course, we are planning and working on more vestments for the future. Happily, the list of projects is shrinking – and in good time! We are now able to shift the work of our hands to making rosaries, chaplets, scapulars, and relic badges. These sacramentals are in demand all year, but especially for Christmas gifts. One Sister, writing her family, told them she liked to think of all those rosaries finding their place under the Christmas trees of all the good people will use them to pray and honor Our Lady. 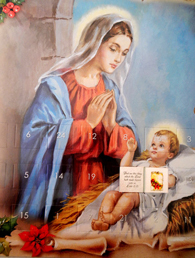 December 8th is again the “deadline” date for rosary orders to arrive by Christmas. We have also taken time to find new Christmas ornaments and gifts for the season, which you read about above. Being Carmelites, we don’t have much use for perusing catalogs, but we have been happy (and relieved!) to find reverent, artistic and quality items for gifts. We are very picky and choose few, but worthwhile pieces, and we made a few recreations out of the choosing! On All Saints Day, after our chanted High Mass, Our Mother Prioress surprised us all by announcing, “We are going to have a picnic.” The Sister cooks for that day just switched a few gears to provide for a lifting of the meal outdoors. November started out mild, warm and hardly like a month before winter at all. The Sisters, therefore, enjoyed a lovely feast, picnic style, sitting near our two maple trees, all in their fall finery of red and gold. Summer really lingered this year.. The new stone path is all done, except for another treatment of gravel filler between the stones, which will be completed before Thanksgiving. More than once over these last few weeks, we’ve been able to see what a wise investment this was, and yes, we rather wonder why we didn’t do it long ago! Gardens, for the most part all cleaned up and composted to be nourished over the winter. Heavy and possibly frequent snows are predicted for us this winter, and that will be nice for all the trees and plants. Readers’ suggestions for newsletters often request personal life stories and about how the individual Sisters found their vocation to Carmel. Since Carmelites leave the world for the very purpose of becoming unknown, unsung and hidden, we keep the custom of not publishing personal stories. But some general details seem of great interest and can give you a good idea of the workings of the good God in souls whom He calls to “scale the heights of Mt. Carmel.” The two martyred Carmelite Religious we spoke about above inspire us to share something about a few of our Sisters who entered Carmel a little later in life, after college. Like Denis and Redemptus, they pursued prosperous work in the world. One Sister did try a vocation with an active Religious Order in her teens, but God let her know that was not where He wanted her to be. She entered Carmel after 30, so for many years, she had kept her heart’s desire between herself and God, while waiting upon His providential designs for her life. Some of these Sisters were busy accomplishing the goals of their college studies, one a nurse, one a hospital dietician, another a schoolteacher. One worked as secretary/bookkeeper for her family’s small business, another opened a popular retail shop in her town. 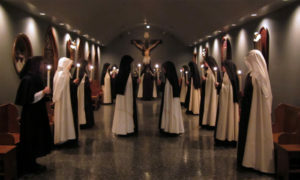 As it happened, the circumstances in these women’s lives allowed for the later vocation, but traditionally, it is almost never the most ideal of situations to enter the cloistered religious life later. The world’s influence can be both good and not-so-good, and the putting aside of one’s own achievements in the world is never an easy thing to do. As well, obedience can be very difficult for those who have lived on their own for many years and are accustomed to our American notions of independence and self-sufficiency! O God, Who led Blessed Denis and Redemptus in a wonderful way through the perils of the sea to the palm of martyrdom, grant that in the midst of the many things of this world and the attractions of this life, we may remain, through their intercession, faithful to death in the confession of Your Name. As the days and weeks of November quickly pass, be assured of our prayers for you – and for your deceased loved ones.